Am I really as rude as this eBay customer claims? Today I am seem to be on a roll in the customer service department. Now, without much explanations I want to show you how this has happened and ask for your opinion on whether I am really as rude as this customer claims I am. 1) Customer buys our repair kit "EBR36954501 EBR39214401 EAX36953201 YSUS REPAIR KIT" as can be found on eBay under item number 160503144701. 2) We send the item and customer receives it. The buyer says the item doesn't match the description. The buyer paid on Sep 12, 2014. The buyer can be contacted at "--- -371-0967" in order to resolve the problem. "I only received the small plaque not the board (green with all the other things on there) that's what I needed. When I search by that part number that's what comes up every where but that's not what I received." "What you say you need is simply not what you ordered. I believe if you take a minute and make a deliberate effort to open the listing and read it the confusion will become evident. What you received is exactly what is advertised and very clearly described. You will probably want to return it back to get credit. But, for one last time, what you received is EXACTLY what is described." "Coppell TV Repair (www.coppelltvrepair.com) is offerring you the two essential components needed to repair LG sustain board EBR36954501 . Those are the large IC voltage regulator (called IPM) and a fast acting 4A fuse which burns when the IPM fails. (Note you are not getting the board on the large picture; it is put there just for an illustration of what this kit is intended for!)" "Your response is rude and uncalled for. I opened and read the listing prier to me placing the order. And yes obviously I was confused as to what I thought I ordered. I am not a TV tech nor know enough about TV parts to have known that what I ordered was not what you CLEARLY displayed on the picture. My mistake. But a simple educational explanation would have been more ADEQUATE, PROFESSIONAL and APPRECIATED. As far as what I want to do next is to not do business with your company. You can take those $34.95 and go take some customer service classes. Because based on most, if not all of your replies to your customers, you desperately need them. My first and last time doing business with your company. But I'm sure it doesn't matter to you since your making money. " Now, I will ask again and for the last time: Was I being rude to this customer? And, whether yes or no, do you believe he or she has read the listing as they claim they did? If you believe I was rude please tell me how and , perhaps just more importantly, refrain from doing business with me! A customer sent us a pair of Samsung LJ92-01490A Y-Main and LJ92-01524A dual buffer board for diagnostic and service. After checking both boards on the bench we found nothing wrong so we put them in the testing unit and they worked just fine. We returned the money paid by the customer on eBay for the Y-Main repair service ($69.95 at the time; repair orders placed via eBay are paid in advance as opposed to after successful repair or diagnostic service as we do for boards submitted through our site, i.e. our direct customers; this case is a good illustration of why we do not take money upfront). Subsequently we invoiced customer $37 total made of $20 diagnostic fee and $17 for return S&H; the usual amount for return S&H is $12 to $15, but in this case is more due to the long dual buffer board. Customer took a few weeks to get back and eventually stared disputing first the amount on the basis of eBay advertising "free shipping" and later for the fact that the boards may not have been working. "the tv shop in Indiana pa------we sent you a y -sustain board and buffer board------the y sustain board has for a fact -----shorted output transistor----I wanted you to repair this board------your trying to tell me its not messed up-----your wrong===better look again----I paid 15 dollars to get it to you------now your telling me its going to cost 37 to get it back ---not fixed-------im upset about this----------ive been fixing tvs since 1973-----I know a blow up when I see it--------------we were looking for a good rebuilder for these-------we repair roughly 40 units a week." In addition to the bad grammar and punctuation it features some bold claims (of us being wrong) as well as some really impressive arguments on their ability to analyze and troubleshoot boards. I am not writing this article to get back at the customer. I am posting it here and will be sending others to this post as a reminder to be careful with the statements you make and to not use your past experience or even current experience or volume as an argument for convincing others they are wrong. Try sticking to measurable, provable facts. A local business had a fleet of 50'' Hitachi plasma TVs they wanted us to repair. They were all P50S601 and most of them had the typical buffer board issues, which requires either the SDR-U FPF47R-SDR60795 or the SDR-D FPF47R-SDR60805 to be replaced. Or both, if you want to do it the right way. Anyways, few of the TVs, though, had bad power supply boards and that made us realize that those are hard to find and expensive. Hitachi P50S601 uses power supply board MPF7726L. A decent service manual for the TV and some additional ones for the power supply can be found at the Hitachi website. Hats off to Hitachi for publishing that and, on a side note, the TV itself is also very very well built (my personal opinion). 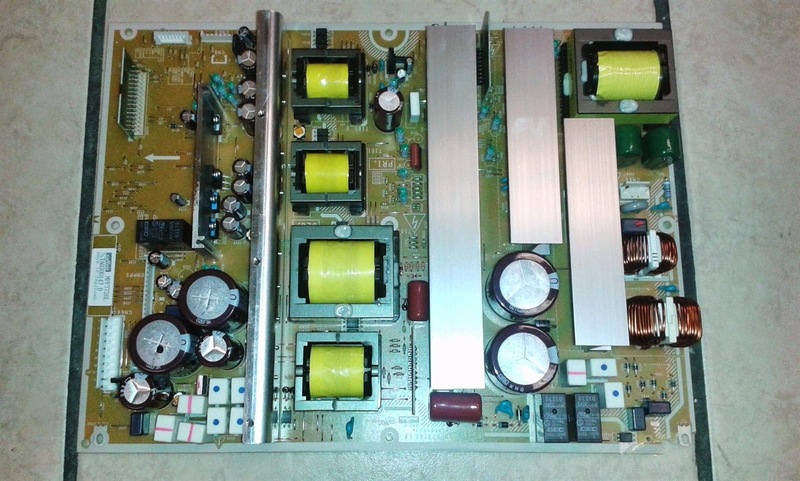 We obtained a few power supply boards and added them to the list of boards we'd like to offer a repair to. In time we most likely will, but at the time being we offer functional boards with trade-in option for the old core. You can find MPF7726L for purchase with a trade-in option at www.coppelltvrepair.com . One thing that was visibly bad on all power boards was the two 3300 uF / 100V filter capacitors, but they weren't the source of the boards' malfunctioning. Those caps can stay puffed (and with lower capacitance) for some time before they start making trouble, but of course if you are so and so on fixing the board you may as well have them serviced...just do not start with them as chances are the problem is going to be elsewhere. Just a quick note informing all our customers that we have a server problems resulting in temporarily loss of web and email services. We will be working to restore access throughout the day.